4th Round Pick- Jalyn Holmes- DE/DT, Ohio St.
Vikings selected Ohio State DE Jalyn Holmes with the No. 102 overall pick in the 2018 NFL draft. Holmes (6’5/283) was a rotational lineman for the Buckeyes’ defense all four years, tallying 14 career tackles for loss and 5.5 sacks, and earning honorable mention All-Big Ten as a junior and senior. Holmes ran well (4.82) for his size at the Combine and did 25 reps on the bench. 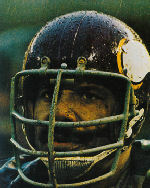 Tall and long armed (34"), Holmes primarily manned three-technique tackle on passing downs in Columbus and won with power over quickness. He projects as a low-ceiling but still-useful situational lineman in the pros. Re: 4th Round Pick- Jalyn Holmes- DE/DT, Ohio St.
Has the upside to start imo but will take a lot of coaching.